The June 3rd front page headline, Trump Risking the Planet for Own Gain, Kerry Fears, resonated with my own sense of the effect of Trump’s ill thought out decision to withdraw from the historic Paris climate agreement. The article leads with how Kerry, just one year ago, his 2-year-old granddaughter Isabelle, in his lap, signed the historic climate accord. And now, only 13 months later, at first pretending to have listened to all sides of the evidence, Trump has discounted and misrepresented the scientific evidence, which mandates the necessity of attention to climate change. All during May, from dawn to dusk, and sometimes during the night, these erratic-in-weather spring days seem to match President Trump’s fitful tweets and irrepressible amoral edicts. As a gardener, I live close to the earth and its seasons. Every day, I am wedded to checking the weather and scanning the garden to see how my plants, trees or shrubs are faring. Rain causes wilt, rot, and satisfying plant growth, excluding the intrusive weeds. The absence of sun is frustrating and challenges my planting and weeding schedule. Yet, each day, I am grateful to arrive at a space of quiet, soft moist smells and beauty. During this past two weeks, the purple arrivals— iris, lilacs, and columbine have given way to mounds of white rhododendron blossoms trailing above the pond. The effect is inviting and calming. 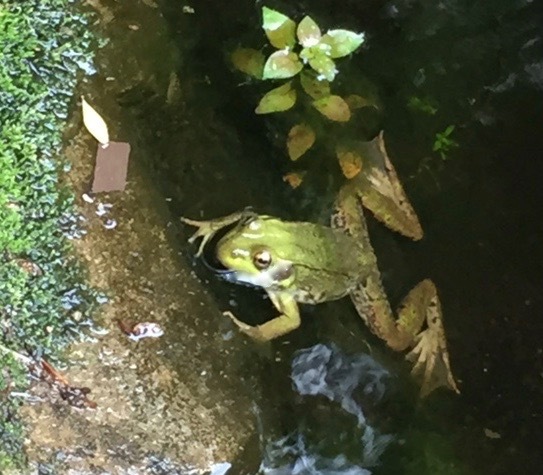 Just yesterday, as I began my daily soul tracking near the small pond, a lean and muscled green and brown frog leapt from the water and jumped to the far side where it sat at the edge, as if in listening mode. The frog did not flinch, unafraid. “Lovely day, I’m glad for your presence,” I continued. That statement, said aloud, bore the truth. This rainy spring, in particular, whenever I have approached the pond area, I’ve been greeted by a shrill “eep” sound followed by a flash and a splash. But this silent, still listener was different, seemingly curious. I felt comforted by his calming presence, a sign from the universe, I was certain, that taking note of the small things in our environment best feeds and forms our sense of connection and meaning. I am grateful for mayors and governors who are stepping up to counter the effects of shifting environmental challenges on their citizenry every day. I appreciate organizations such as 350.org, The Sierra Club, Green Peace and Union of Concerned Scientists. I am especially grateful to Governor Jerry Brown for his passionate engagement and willingness to explore sustainability options with China, and Mayor Michael Bloomberg’s willingness to pledge $15 million to support the United Nations agency that helps implement the Climate Accord agreement. There is something to be said for the groundswell of concern, worry and love for Mother Earth. Perhaps, the full effect of Trump’s egregious decision to abandon responsibility for Earth’s well-being will fuel and feed our considerable will and creative energy to find more useful and usable solutions to sustainability. One can only hope. This entry was posted in Creativity, Currents, Happiness, Nature, Politics, Relationship(s), Sustainability, Uncategorized, Well-Being and tagged Climate change, gardening, Mother Earth advocacy, Soul Tracking on June 5, 2017 by fayewriter. I began to shape this post in Mid-September, around the time shadows grew, light waned and plantings began to lose color and die off. One of my greatest pleasures and passions is gardening. From early April to mid October, every time I enter my front garden filled with an array of perennials, annuals, shrubs and trees, I am immersed in a spectrum of colors, shapes, and smells. Daily, I scan and take stalk of each bed. I look for blooms and insects. I consider what plant needs deadheading, cutting back, or water. I note leaves. Are they wilted or firm? Each plant has the potential to invoke its own sense of gratitude. Shower a drooping zinnia; and within minutes, its head will lift, its leaves will splay with vitality. My wide, dapple-leaved Daphne shrub, a six-year survivor of three, gets first prize for beauty and resilience. Mornings in July, I resonate with the intoxicating rhythms of sun-lit lilies—purple, red, effervescent yellow, and peach. Their lace-fringed petals, vibrant throats, nubile stamens fuel my gratitude. At day’s end, when a blossom has twisted and closed, I note with gratitude the eloquence of its soft coil. Labor Day weekend, a marker of summer’s end, I needed a memory maker, a new space to explore, something to lift my spirits. Marv and I searched out and found the walking path around Waban Lake, adjacent to Wellesley College in the next town. The trail was mixed— at first, urban, cared for by the college groundskeepers, wide, even and pretty. But in short order, it shifted. Dirt based, slopping and rugged with varied leafy and evergreen trees, the feel was at once familiar, reminiscent of long ago campfire girl camp hikes at Camp Hitinowa on Lake Cobboseecontee in Lichfield, Maine. We walked with caution on the uneven terrain thick with tree roots, when the forest cleared and we came upon a stone, castle-like mansion with a front yard hillside of sculptured trees facing the lake. I marveled at the thought of the bevy of gardeners on ladders, the balanced effort it must have taken to shape these trees into thick, round discs reaching skyward. The effect was old world, perhaps, French, leaving me to wonder about the marvel of contrasts, how a new trail can engender the unexpected. The property’s walkway was groomed, wide and even, bounded by a likeside stonewall. Along the edge of the perimeter, I came upon several thick lily beds with a rich harvest of sticks. No markers for the colors that had gone-by, I could only imagine the lush foliage. 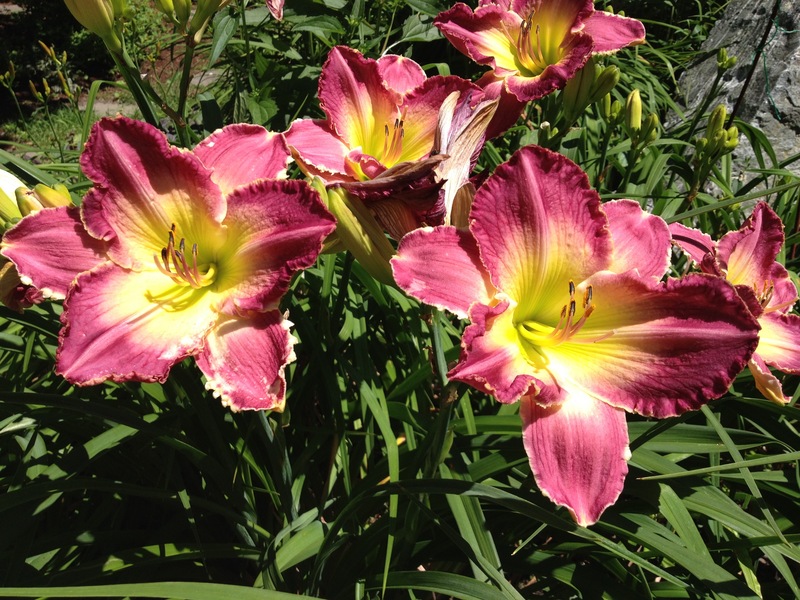 The stretch was sunny, facing the bucolic lake, an ideal location for lilies to flourish. I was at once at home, delighted to come upon the familiar yellowing leaves—grateful for my day’s quest and the promise to return and witness their blooms come summer. 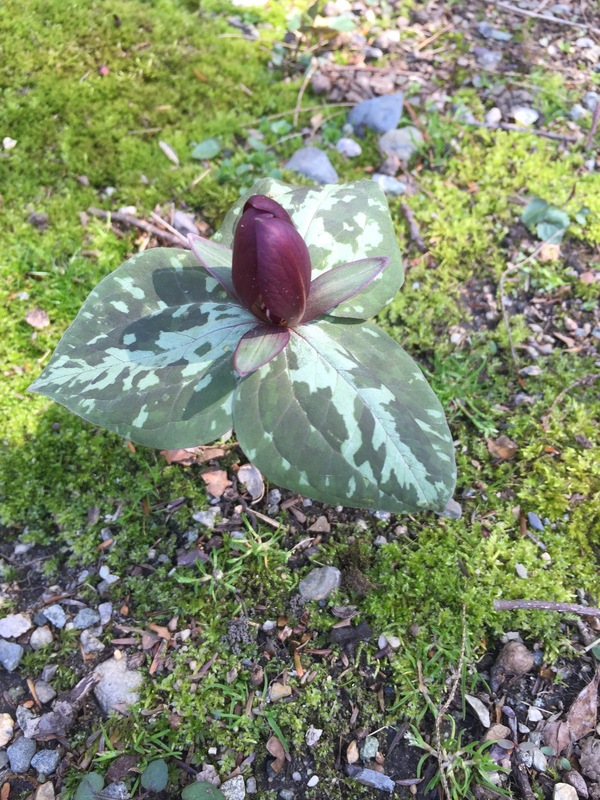 This entry was posted in Happiness, Mindfulness, Nature, Relationship(s), Uncategorized, Well-Being and tagged day trip, daylillies, gardening, gardens, Waban Lake on February 29, 2016 by fayewriter.